Had them for a couple thousand miles. They have worn better than most all terrains. I have taken them through every terrain including steep hills that are icy. They handled amazing and I never had to use 4x4. I have 45,ooo mile on these and still have 9/32 left on them. New they have 20/32. As they wear down, they do become a little noisy, but that's the tire. I have had the old style mudders and have gotten the same mileage out of them. I do rotate ever 5k miles. Front to back and criss cross on rotation. Awesome tire. Tread life lasts a lot longer than the Mickey Thompson Baja mtz. Would deff recommend to a friend. I bought a set of four plus one for a spare five years ago. Still have tread & never had to use the spare. I use as a daily driver & off-roading. Great tires & would definitely buy again. Absolute best mud tire if your mud truck is also a daily driver. Great tires! They have lasted me six years. My Jeep is an everyday vehicle and I take it out rock crawling. These tires still have more than 3/4 of thier tread still on them. Great quality for the price! This is my second set set of theses BFGoodrich tires!! I absolutely love theses tires!! I would buy again when I wear them out!! Best off road tires and quiet on the highway too!! I love these tires. I run 285/75/16. Awesome tires. Aggressive looking, off road and on road capable and great looking. 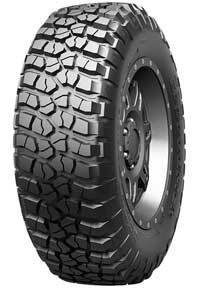 I Purchased these tires (BFG M/T KM2) and use them on my '95 Jeep Wrangler. I mainly drive on the street commuting to work and school but I also go off-roading quite often. The traction in the woods is amazing and I could not complain. Wouldn't let me choose F250; I definitely didn't put these guys on a Focus- HAHA. I love these tires. They're great for highway driving and around town. They look pretty good on my 2001 F250. They're big and tough looking for sure. I would definitely recommend them for the price. These tires are my 2nd set of BFGs. My first set lasted 5 years and 50,000 miles. My rig is street and trail driven so I put the last set of tires to the test. I have no doubt this set will be just as great, if not better. I have conquered this year's snowy NJ winter with ease. Highly recommended to the daily driver and weekend warrior. I found these tires to be very good when off-roading through mud and rocky terrain. The tires worked well in deep snow, but anything under 2-3 inches, the truck would slide. The downfall to these tires is that the tread life was sub-par. My 2500 ate through the tread in no time. I got approx. 15000mi out of the tread, and that estimate is generous. I really like these tires. I would get these again for my truck. Put 32's on my Cherokee and it not only rode smoother and handled better but the real difference was off road. Put in 4-wheel low and it just crawls with these tires. Very satisfied! ! !